Larry Osborn is up and running with his Marlin gun screws now. He has most screws for the Models 1888, 1889, 1893 & 1894, and many screws for the Models 1891, 1892, 1897 and 39. He also has some firing pins and main springs available. 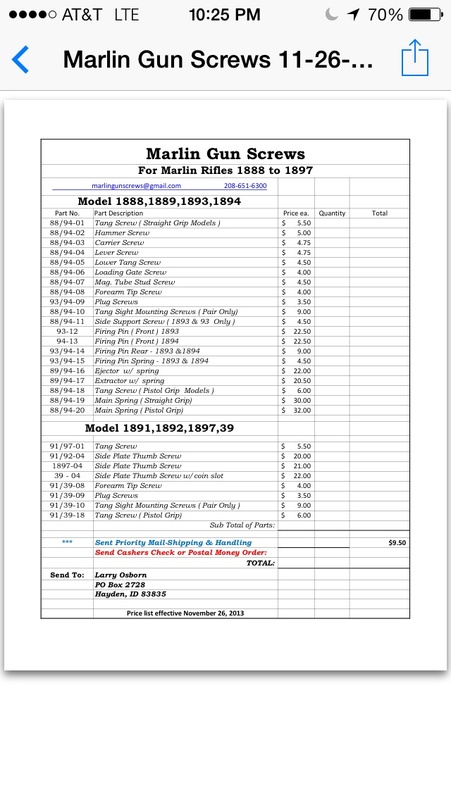 The best way of get a list is to email Larry at: marlingunscrews@gmail.com He can email you a PDF file with the list of screws, pricing and contact information he has available now. He will be working on making other screws available as time and sales permit. His screws are properly shaped with the correct "dome" and finish, so now it the time to replace those buggered screws on your Marlin rifle. Thanks Rick! His screws are nice, those sights he made a while back are nice also! Here's the list of screws! Sorry, but your link to Larry's Gun Screw list does not work for those that are not registered on that site. I recently purchased a full set of screws for my 1893 project and can endorse Larry's product wholeheartedly! They are certainly top-notch! I recently had a friend who was at the big Denver show hand me a card, and tell me there was a guy selling Marlin screws there. I was pleasantly surprised to see Larry's name and info on the card! We used to live just a few miles apart, and I always felt fortunate to have the best Marlin screws on the market so readily available! Larry was a big influence on my Marlin collecting when I bought my first 1893! He helped get it working right, and was gracious with his time and knowledge. He's forgotten more about old Marlin repeaters than most of us know! It's great to see he's back providing a much needed service to Marlin collectors! Ditto what Val said. Larry is a true craftsman, and a good guy. And nice to see you back, Val. Wishbone wrote: Ditto what Val said. Larry is a true craftsman, and a good guy. Retired 3.5 yrs. ago, and been building/racing two hot rods, and remodeling the old house. Haven't been doing much with my Marlins, and sold much of my Marlin repeater collection. Still have all my Marlin Ballards, and adding to them when I can scrape up some funds! Busier since I retired than I was when I got paid to work!